Relating Materials Properties to Structure: Handbook and Software for Polymer Calculations and Materials Properties lays the foundation for an understanding of the basic structure of materials and the significant distinguishing features between major classes. It provides a method of comparison between the structure of different classes of materials and their attendant properties. The structural differences between individual polymers and the resultant properties are a primary focus, since this is the only class of materials where data and techniques allow properties to be estimated. This book and CD-ROM software package provides an easy, straightforward technique for estimating polymer properties via simple software. The software permits the user to see the effects of changing a structure, and to estimate the properties of a polymer that might be unavailable or very time-consuming to find. The ability of the software to estimate the miscibility of various polymer blends is one of its most valuable aspects. While most methods that are extremely easy make simplifying assumptions that adversely affect accuracy, in this case, the inaccuracies introduced do not obviate the usefulness of the software or techniques. 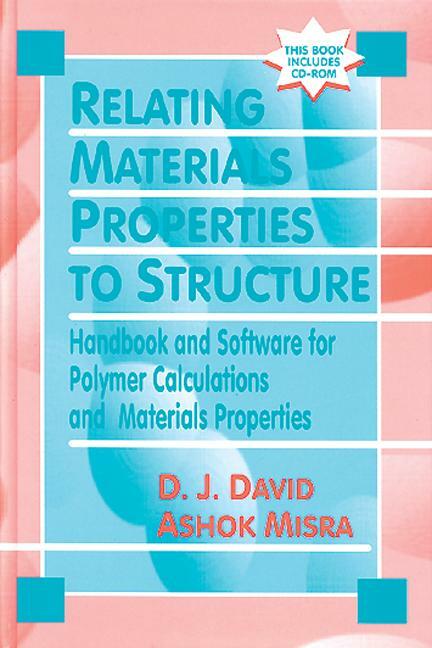 Relating Materials Properties to Structure: Handbook and Software for Polymer Calculations and Materials Properties Software offers the most comprehensive system presently available. Invaluable to all involved in fundamental polymer research, new product polymer alloy development, investigating polymer/plasticizer miscibility, and those involved in designing and specifying polymeric materials required to meet mechanical, physical, thermal, electrical and blending properties. Structural Considerations/Why Materials Differ. Morphology of Materials, Thermodynamics, and Relationships to Properties. Polymer Orientation and Rubber Elasticity. Effective Use of Spreadsheets for Scientific Applications and Estimation of Materials Properties and Miscibility. Polymer Property Estimation and Estimated Properties of Selected Polymers. Molecular Forces and Volumetric Properties. Calorimetric Properties. Structure/Transition Temperature Relationships. Cohesive Properties and Solubility Parameter Concepts. Interfacial Properties. Solution Property Relationships. Optical Properties of Polymers. Electrical Properties. Magnetic Properties. Viscoelasticity and Mechanical Properties. Acoustic Properties. Rheological Properties of Polymer Melts. Transfer Properties of Materials. Formation and Decomposition Properties. Processing of Thermoplastics. Miscibility and Estimation of Polymer Blends Miscibility. Composites: Concepts and Properties.